Includes lessons for age 3 and older from 4:30-6:10 p.m. Mondays and Wednesdays. Group lessons are four weeks long, twice a week. Cost is $55 for non-members; $35 for members. Offered Tuesdays and Thursdays for four weeks. Click here for the flier. Level 1 – from 4-4:30 p.m. 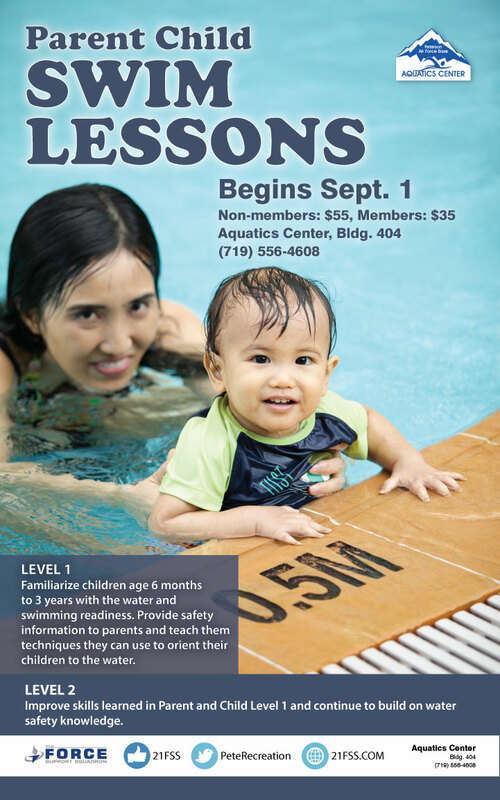 This class will familiarize children between ages of six months and three years with the water and teach them swimming readiness. Provides safety information to parents, and teaches parents techniques they can use to orient their children to the water. Level 2 – from 4:35-5:05 p.m. This class will improve skills learned in Level 1 and will continue to build on water safety knowledge. Cost: $35 for Aquatic Center members, $55 for non-members. A series of eight 30-minute classes on Mondays and Wednesdays starting at 4:30 p.m.
Three sessions are held each night. Learn to Swim signups are the fourth Wednesday of every month for the following month’s lessons. * Please call 719-556-4608 to schedule your lesson. An instructor will return your call and set up a time that fits your schedule. For private lessons, you pay your instructor the day of your lesson.